Photo: Redstone, ca. 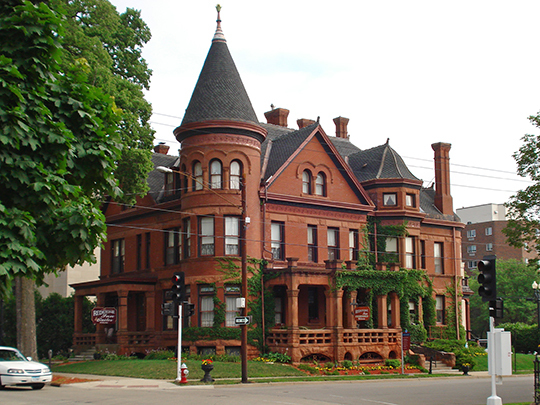 1888, 504 Bluff Street, Dubuque, IA. Listed on the National Register of Historic Places in 1976. Photographed by User:Kepper66 (own work), 2009, [cc0-by-1.0 (creativecommons.org/publicdomain/zero/1.0/deed.en], via Wikimedia Commons, accessed January, 2014. The Dubuque County Courthouse is located at 720 Central Avenue, Dubuque, IA 52004; phone: 563-589-4471. The area that is now the State of Iowa was included as part of the Michigan Territory in 1834. When a portion of the Michigan Territory was admitted to the Union as a state in 1836 the rest was set aside as the Wisconsin Territory, which included all of what is known as the State of Iowa. Iowa was originally two counties, Demoine County and Dubuque County. In 1837, during the second session of the Wisconsin Territorial Legislature, Dubuque County was subdivided into 14 other counties: Benton, Buchanan, Cedar, Clayton, Clinton, Delaware, Fayette, Jackson, Johnson, Jones, Keokuk, Linn, Scott and Dubuque. Dubuque County contains land area of 612 square miles which includes the City of Dubuque as the largest of 21 cities in the County and which serves as the county seat. The first official meeting of the Dubuque County Board of Supervisors was held on May 13, 1836. The first courthouse building was made of logs and was completed October 1, 1836. It was intended to be used as a courthouse; however, it was never used for that purpose but as a jail instead. The present courthouse was completed in 1893 and is still used as the main county office building today. In 1838, Dubuque County had 2,381 inhabitants; by 1856 that had risen to 26,871. Dubuque County has experienced some hard economic times in which the population dropped from 93,745 in 1980 to 86,403 in 1990, a drop of 7.8%. The steep decline was due in part to the sale and ultimate closure of the Dubuque Packing Co. and the farm crisis which caused the reduced demand for equipment at John Deere Dubuque Works. ECIA, Dubuque, IA, Dubuque County Regional Smart Plan, 2013, www.dubuquecounty.org, accessed January, 2014.